Here are the last two cards in my Prima Divine series. I have used the same sketch to create these two – I love this design and can’t wait to try it out some other papers.Lots of layers, some cut into oversized banner shapes, and every edge distressed and inked with Tea dye ink.I made the flowers with Spellbinders bitty blossom dies, and the flourish is memory box La Rue flourish.A tiny bit of lace finished this design which as I said previously I actually saw in a cardmaking magazine! Til tomorrow…. 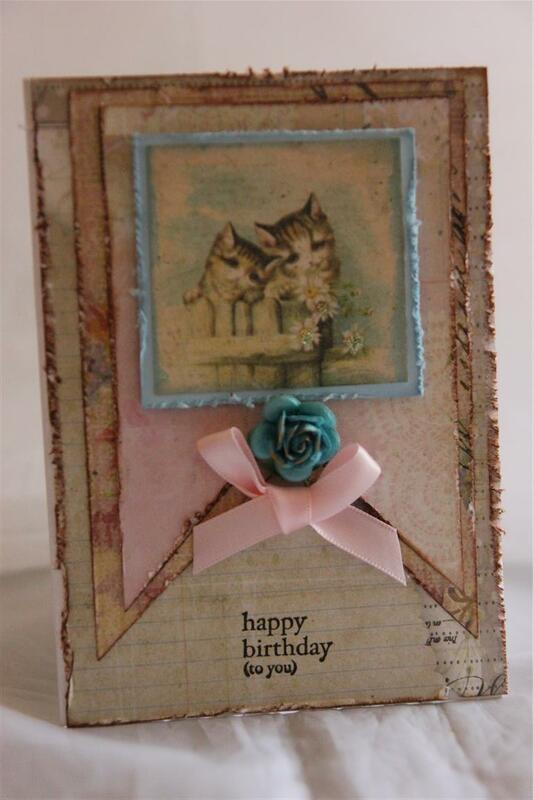 This is the second to last card in my Prima Divine series, and here I have used all the bits of strips that were left on my desk when I made all these cards.I inked around all edges with ranger Tea dye ink, and distressed most edges. I added a little lace and some kaisercraft rhinestones to this one. A lovely class with my ladies this morning, and now three days off to spend some time working on my June lessons! Til tomorrow…. Prima Divine paper, the a4 size pad, with a little fussy cutting, and just two ribbon bows. The sentiment is a stampin up stamp. I inked all edges with tea dye ink, and cut the bird out twice and put the second one on top of the first with a couple of foam pads.The banners were already shaped like that on the paper so it was just a matter of cutting them out – too easy!Til tomorrow…. 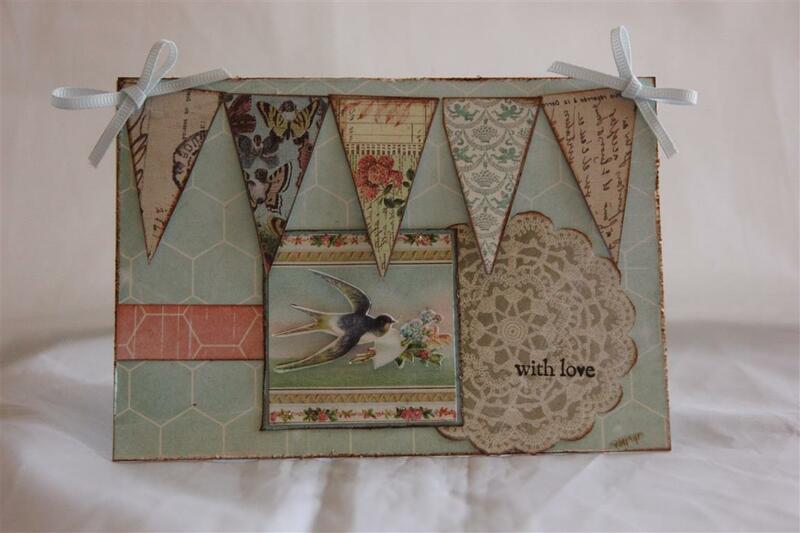 Prima Divine paper,and just a lot of fussy cutting! I edged around most pieces with tea dye distress ink, and just added 2 ribbon bows and a little flower. the sentiment is a stampin up stamp. The banners are also fussy cut from the paper collection. Taught a class this morning then went through a new box of paper to choose some bits for upcoming classes – there are lots of new new paper collections from Kaisercraft to look forward to! I had such a hard time choosing. 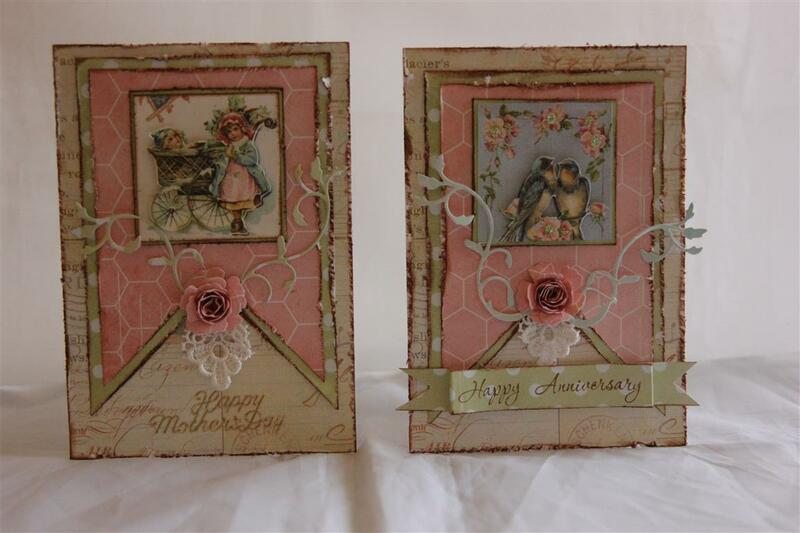 Til tomorrow…..
Straight off the bat I want to say that I saw the basic sketch for this design in a magazine and loved it so have done a few cards using this lay out of big banners. The paper is Prima Divine, and I used my Martha Stewart distress tool to really distress all the edges. I inked all sides with Tea dye distress ink, and added a prima flower, a ribbon bow and a sentiment using a stampin up stamp. Today I have been getting inky making teen boy cards. as I was creating I thought that this is truly the hardest group of people to make cards for – why? I think its because I know what teen boys like – my boys have told me – the inkier, grungier and graffiti covered the better – but the people buying these cards – usually mums and nans don’t particularly like this style at all. How to please both ? One son suggested two signs in my boxes – one that says cards teen boys will love, and the other cards you love for teen boys!I am still working on a happy medium! Til tomorrow…. 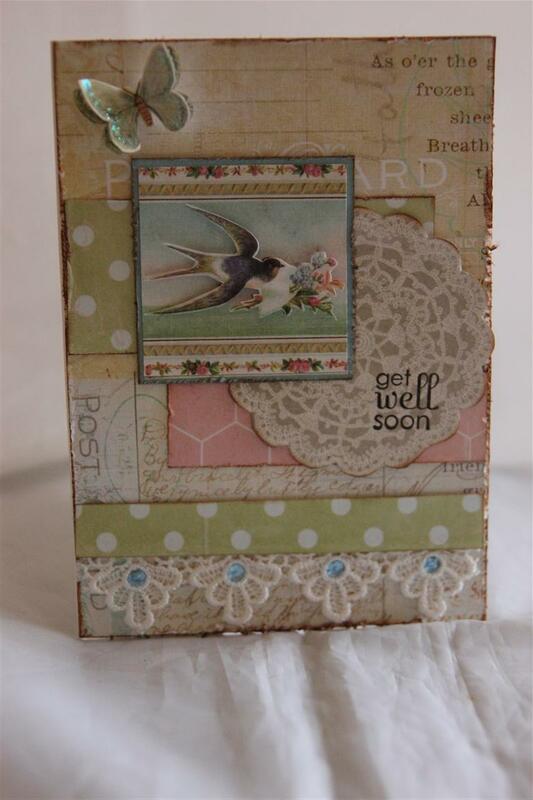 Today we start my Prrima Divine series – This paper is right up there with all time favourites, it has a distinct vintage flavour and lends itself well to shabby chic as well – my favourite styles! 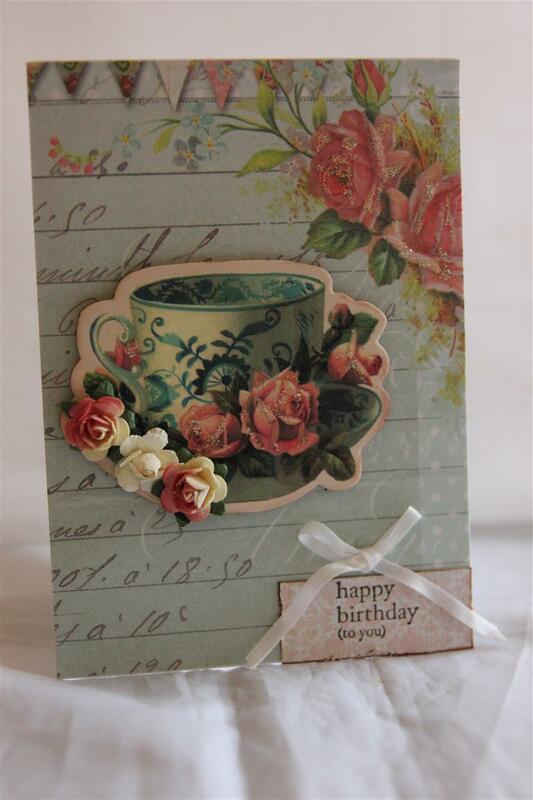 It distresses well and so I did a lot of that…..I bought the a4 pad in this collection, because its tailored made for cardmakers, the size means each sheet can cover 4 cards comfortably with no waste, and I also purchased a sheet of chipboard pieces – the tea cup on this card is one of them. 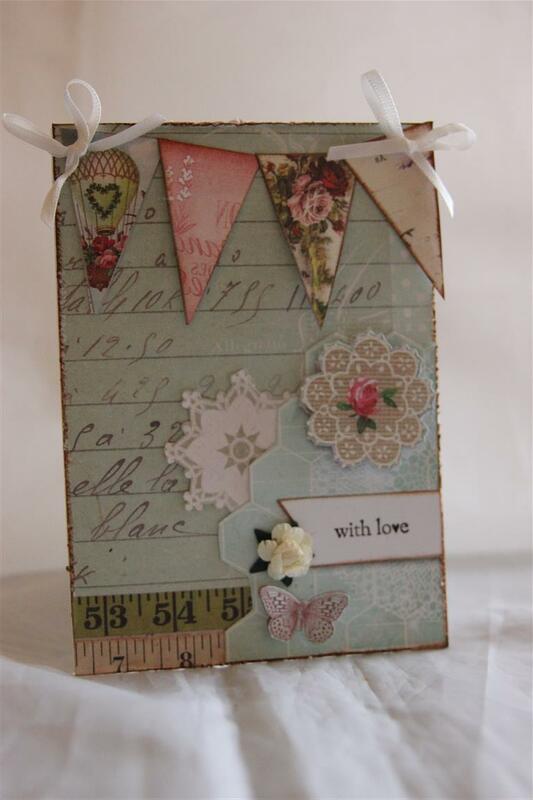 I inked aroung all my edges, added a ribbon bow and flowers and stamped a sentiment with a stampin up stamp.